One of the best kept secrets of the art world for almost twenty years is that Thomas Kinkade, often referred to as the Painter of Light� *, painted a beautiful body of work over a six year period, from 1984 to 1990, under a brush name. The brush name Thomas Kinkade used was �Robert Girrard'. It is believed that Kinkade's �Girrard' body of work numbers no more than 70 paintings and two pencil drawings. The rarity and individuality of these works, together with their subtle beauty and turn of the century charm, distinguish them from other segments of Thomas Kinkade's work. In 1984, Thomas Kinkade's friend, George Goff, opened Cottage Gallery, an originals art gallery in Carmel , California . Thom came to Cottage Gallery from the prestigious Biltmore Gallery in Los Angeles where he had been showing his original paintings for several years. In the early 1980's Thom was inspired by the work of a variety of artists, including the painters of the Hudson River School . By 1984 he had garnered a substantial number of collectors for his romantic landscape paintings and was becoming recognized on the national art scene as a rising star. Thom's starving artist days were well behind and his future was filled with promise. Eventually, the western themed, romantic landscapes Thomas Kinkade had been painting almost exclusively until the summer of 1984, were not enough to satisfy his creative longings. He yearned for a broader color palette, bolder brush strokes and the gaiety of turn of the century imagery. Like millions of others, Thomas Kinkade was enthralled with the work of the French impressionists and desired to paint in that style. Thom loved the unbridled use of color the impressionists indulged in and the �broken color' technique they used in applying it. He also was inspired by the beauty and timeless appeal of the subject matter the original French impressionists painted. Sitting around a table in Thomas Kinkade's then Placerville, California home in August, 1984, three friends conceived the name �Robert Girrard'. Thomas Kinkade, George Goff and their mutual friend, Terry Isbill, had fun that summer day as they bandied about a variety of �French sounding' names, trying to find one that would compliment Thom's desire to add a French impressionists' inspired style to the beautiful artwork he was already doing. When the name �Robert Girrard' was pieced together, all agreed that it sounded �just right'. After selecting the brush name �Robert Girrard', Thomas Kinkade was so inspired (and excited) that he painted his first �Girrard' painting that very day, a small vertical piece titled �Gazing�. While this lovely little ala prima piece did not have the many days of work in it that subsequent major �Girrard' studio works would have, it was an entirely engaging painting. George Goff is still in touch with the painting's owner who told him recently that �Gazing� remains one of her most loved paintings, though it is but one small work in a large and remarkably beautiful collection. Watching Thom paint �Gazing� on that August afternoon, George and Terry were fascinated by the way he created the painting from his mind's eye, without benefit of any reference materials. Thom used colors in �Gazing� his western landscapes had not seen, and spontaneity and joy were evident in the completed painting. Thomas Kinkade's �Robert Girrard' paintings came from his heart and what he learned in creating them forever changed his artwork. The �Girrard' works had an almost immediate influence on Kinkade's landscape work, as he began to find ways to paint more color into them. Though the last �Girrard' canvas was completed in early 1990, the legacy of �Girrard' is reflected in the broadened palette, more domesticated scenes and numerous small subtleties found in many of Thomas Kinkade's post �Girrard' period works. There are different periods in the careers of artists which, when taken altogether, comprise the tapestry of their artistic lives. Some have expressed wonderment, others nostalgia, that Thomas Kinkade ever stopped painting his �Girrard' canvases. 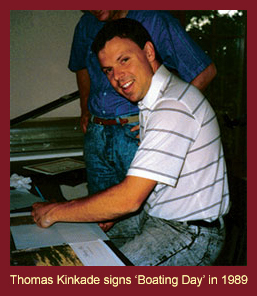 For those who have come to know and love Thomas Kinkade's �Robert Girrard' paintings, there is thankfulness for the six special years they represent.